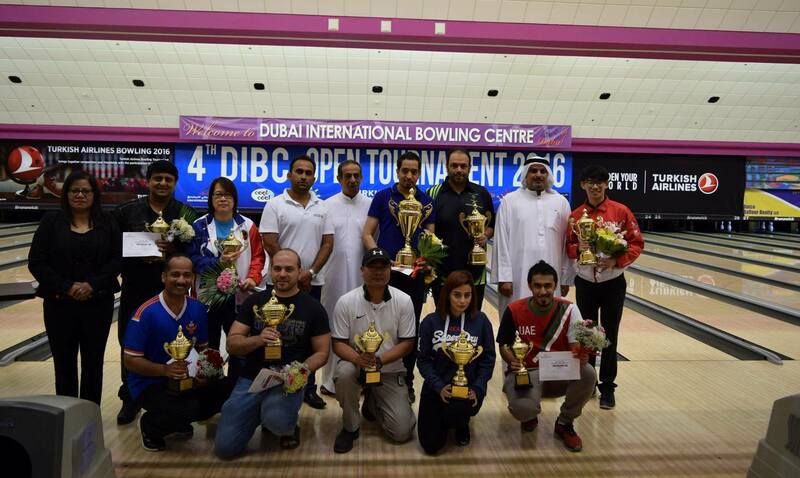 26th March, Dubai: Top seed, Naif Oqab of the UAE lived up to seeding expectations to bag the Open Masters title of the 4th DIBC Open Bowling Tournament on Saturday. Naif Oqab, who reached top seed billing in the stepladder finals only after the 6th and final game of Round 3, fought a closely contested match against HRH Prince Mohammed Al Saud of Saudi Arabia, needing a spare and strike on the 10th frame to shut out any chances from the in-form Prince to win 214 against 200. Earlier in the second match, Prince Mohammed defeated 19-year old and 4th seed Basil Ng of Singapore by 2 points (197-195), while the Singaporean youth brushed off the challenge from 3rd seed Shaik Abdulhameed of India (227-206). Naif Oqab bagged the Champion’s Trophy and top prize of AED. 25,000 along with a return air ticket courtesy of Turkish Airlines, while Prince Mohammed settled for the 1st Runner-up Trophy and AED. 12,000. Basil Ng took home the 2nd Runner-up Trophy and AED. 8,000, and Shaik Abdulhameed received AED. 5,000 as 3rd Runner-up. In the Graded A Division, Kholoud Akram of the UAE ladies national team stood firm to ward off the strong challenge from Rex Galang of the Philippines who defeated his compatriot and 4th seed Manny Riveral and two-handed bowler 2nd seed Humaid Falah of the UAE in the previous two matches. All top 3 winners received cash and trophies. The Graded B Division brought out an unexpected result with a qualifier from the Desperado Squad and 4th seed for the stepladder finals conquering the higher seeds to clinch the top honor in this division. Jihad Habib emerged champion with Liza Lugto of the Philippines finishing as 1st Runner-up, Jaezen Plata and Mark Bumagat both from the Philippines finishing 3rd and 4th respectively. In the Graded C Division, Abdullah Al Suwaidi of the UAE won his first ever Champion’s trophy, Cyprian ended 1st Runner-up with his contemporary from India, Sangram Bannerjee, placing 3rd. Hilda Pilipina of the Philippines settled for 4th place. This year’s tournament was well-attended with huge numbers of participants coming from Singapore and Saudi Arabia. Participants also came from India, Pakistan, Bahrain, USA, England and locally based bowlers. The main sponsor was Dubai International Bowling Centre, supported by Bowling Corner Sports Equipment with Turkish Airlines, Dutco Balfour Beatty, Axiom Telecom, Cool & Cool, Al Wahdania and Parthas Textiles as co-sponsors. The tournament is sanctioned by Emirates Bowling Federation, Asian Bowling Federation and World Bowling.